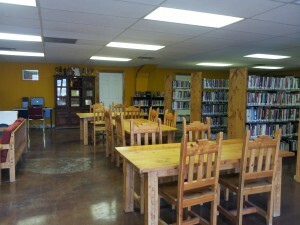 The City of Sunland Park faced a crisis in 2012 and city leadership felt its best option was to close the library’s doors, leaving a building full of literary treasures, public computers, and other resources untouched and off limits to the community for more than two years. 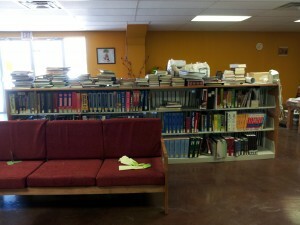 During the closure, Sunland Park residents had limited access to library services. The closest New Mexico library is forty miles away in Las Cruces. Closer to Sunland Park is El Paso, but the Texas library charges a hefty fee for out of state residents to check out books. Most citizens went without a library. In the fall of 2014, the city hired a part-time library director for 20 hours a week to re-open the library. Martha Holguin, who had worked at the Sunland Park Community Library for a few years in the early 2000s, accepted the challenge. The task of preparing the building for re-opening was a titanic one that Holguin accomplished with the help of two dedicated volunteers. During the closure, the roof had leaked leaving many books damaged and moldy. 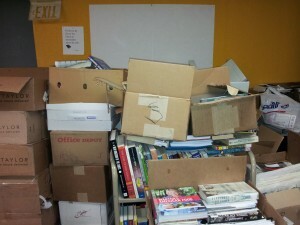 Another challenge for Holguin was to understand how the library had been organized previously. She re-catalogued many of the books and arranged sections in a way that were more conducive to patrons’ needs. She moved children’s books to the more accommodating lower shelves and made the adult sections more user friendly for patrons. The library also adopted the new Biblionix Apollo Automated System, an online public access catalog. They were unable to upload their current records due to budget restrictions, so Holguin has to scan and input most of the books manually. However, she says the system is user friendly, making the process much smoother. Patrons are all being issued new library cards, and using the new system, they can reserve and renew materials from home. While Holguin and community helpers worked through these problems behind closed doors, the buzz around the community that the library was back had begun. Customers frequently knocked to ask when the library would be open. Holguin often gave these patrons the opportunity to use the computer lab to look for jobs, work on their taxes, update their resumes, or check emails. Senior citizens attending the lunch program next door would often stop by to read the daily newspaper or magazines since books were not ready for checkout. Because of word of mouth, Holguin only had to do a small amount of promotion that the library was re-opening. She walked around town with the mayor and police chief to inform residents, and she also placed flyers in stores, agencies, and schools. Holguin was tasked with all of this while only working 20 hours per week. “At part time, I felt a lot of anxiety,” Holguin said of the amount of work that needed to be done in a short amount of time. She eventually was able to convince city leaders to allow her to work 25 hours per week once the library opened. 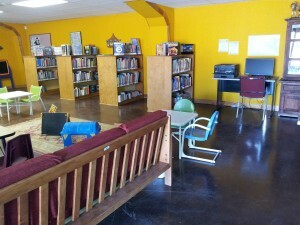 The Sunland Park Community Library is off and running with programs. In February and March, they hosted early literacy programs for parents and pre-kindergarten children. Holguin plans to continue to grow the library’s program offerings to the community including hosting GED and ESL classes, story time, afterschool programs and more. Congratulations to Ms. Holguin for accomplishing this immense task and helping to bring back these integral services to Sunland Park!